Happy St. Patrick's Day! Now that it is here, make sure you get some photos to scrapbook. 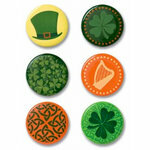 We've done a little searching and found some more things to help you make layouts for your St. Patrick's Day photos. 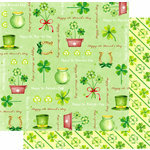 Vintage printable Irish collage images here from FontYourself. See one photo below. Felted photo album / brag book below is from KnittedFreshDaily. SugarSkull7 is selling the handcarved shamrock stamp, shown below, in their Etsy shop. Digital printable frames and paper below are from SpectacularPrintable. 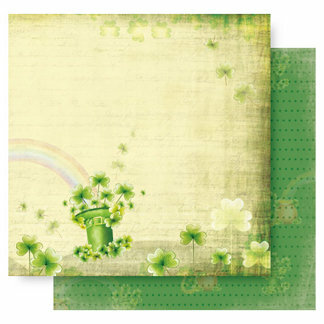 CardCandyBoutique makes the Shamrock Paper Posies shown below. Kreatorville Kraft has these cute Leprechaun handmade embellishments. See them here. This entry was written by Angie and posted on March 17, 2010 at 8:00 am	and filed under Scrapbooking, scrapscene, StPatricksDay. Bookmark the permalink. Follow any comments here with the RSS feed for this post. Post a comment or leave a trackback: Trackback URL. What pretty projects. Just love those vintage collage images.